Society visit to the Milestones Museum. The museum is fully enclosed - and a cool spot on a rather warm and sunny day! The museum was built by Hampshire County and Basingstoke and Dene Borough councils, with the help of a Heritage Lottery grant, and was officially opened in December 2000. The museum includes various 'street scenes', through which visitors stroll, showing different time periods from the mid 19th century to the 1930s. The shops display a wide variety items that could have been bought in the 'High Street' - and even a sweet shop where one can buy 'boiled sweets' and a pub that serves beer. 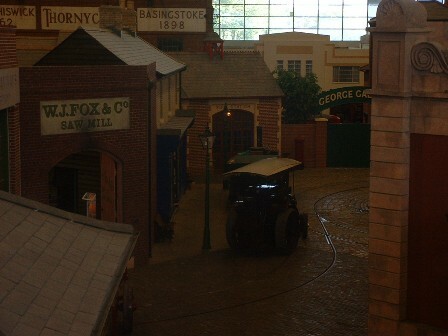 There are also reconstructions of factories, such as the Thornycroft works that used to stand close to the Milestones site. The streets are 'populated' with suitable period vehicles - traction engines, cars, bicycles, lorries --- etc, and other 'features' to 'take the visitor back in time' - advertising signs, phone boxes, news vendor's stand ... etc. Many of the exhibits are 'brought alive' by actors in costume who can demonstrate some of the working practices of the past, or the exhibits in the shops, for example. On the day of our visit, the 'gramophone shop' was able to play old 78 rpm discs selected by some of our group. Milestones is a very well arranged museum - and much to fascinate young or old alike - so whether you like to browse the toy shop, the camera shop, a green grocer's, the ironmonger's, a small car workshop or just the collection of 'domestic' equipment, there is much of interest. 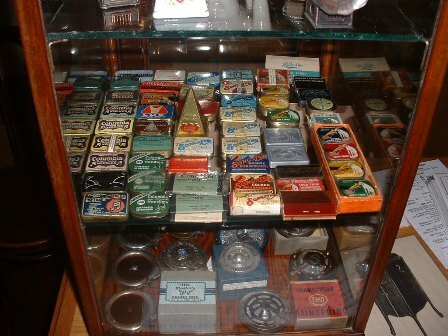 And many of our group found items on display that they well remember using - and in some cases, still use!.